I Am JuJu to “I Wish I Didn’t Have Asperger’s”: AutismPositivity2012 | I am JuJu! 1) I don’t know why they have Autism or Asperger’s! Plain and simple! 2) I do believe that God is in control. I believe He has wonderful plans for both of their lives and that both of them are capable of truly amazing things! 3) I won’t ever stop advocating for them and whatever it is they might need! 4) There are many others all over the world that also fall on the autism spectrum and they are NOT alone! I cling to these things every day! Although I don’t personally have Asperger’s and can not know how they feel (unless they share that with me specifically), as their mom, I hurt when they hurt! I am so thankful for the wonderful individuals on the spectrum that I have met through Facebook and Twitter. I am thankful that they share their struggles and their triumphs! My prayer for you is that you will find the support that you need! Please know that you are NOT alone! 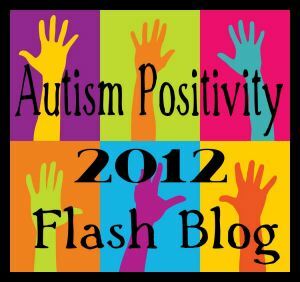 This Autism Positivity Flash Blog Event is the brainchild of Thinking About Perspectives, a group of bloggers committed to increasing autism awareness and acceptance via open and respectful dialogue. We are: 30 Days of Autism, Outrunning the Storm, The Third Glance, Aspie Kid, Flappiness Is,Quirky and Laughing, Life on the Spectrum, Fairy Tale Forgotten, The Aspie Side of Life, and Inner Aspie. This entry was tagged Asperger's, Autism, Autism Positivity 2012, flashmob, I Wish I Didn't Have Asperger's, Why do I have Asperger's?, Why do I have Autism?. Bookmark the permalink.